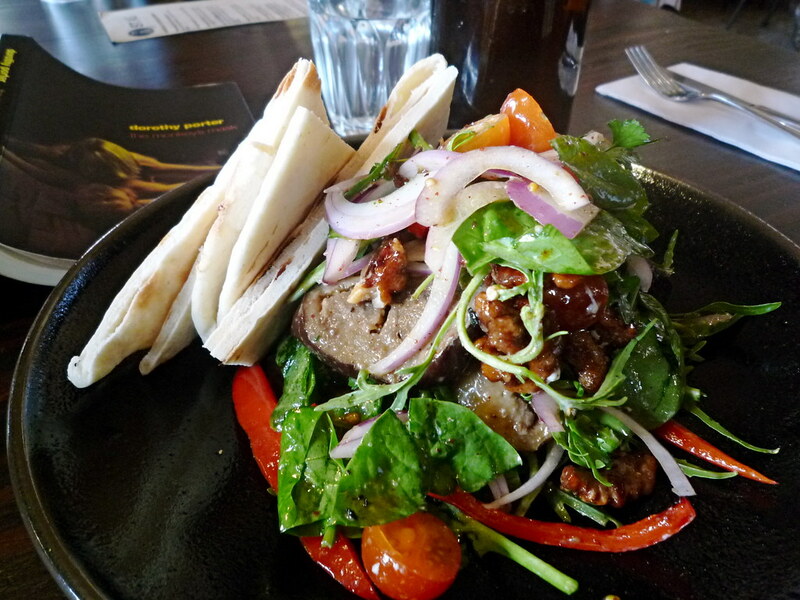 A few weeks ago I decided to give South Melbourne Market a visit, and found myself wandering around the suburb wondering where I should grab a quick bite of lunch. A flick of the Twitter (I'm here, if you're into that sort of thing) and within moments Jack had suggested St Ali. Of course! I'd been meaning to go there for ages. 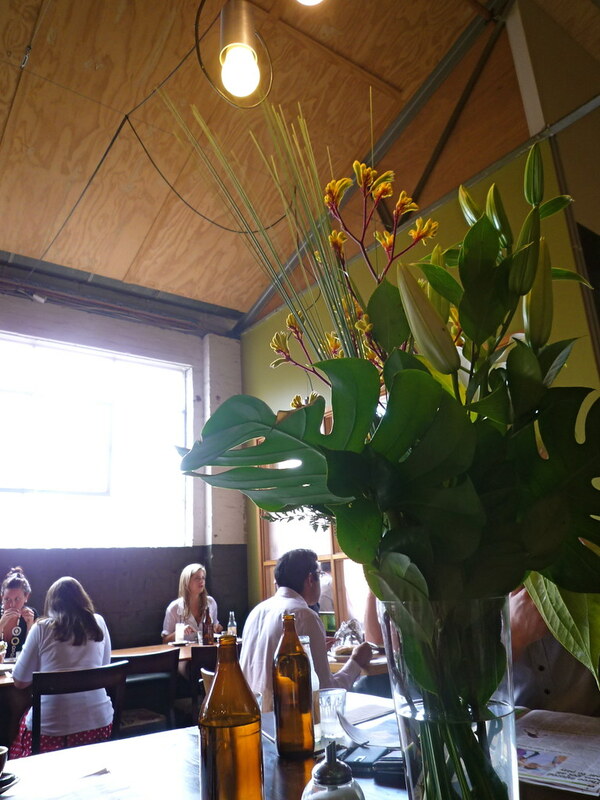 Of course you all know that St Ali is famous for its coffee. I'd heard mixed reports on the food but let me tell you that the salad ($14.50) I had of roast eggplant, caramelised walnuts and goats cheese, served with a pomegranate dressing and warmed flat bread, was bloody wonderful (so much so that it inspired me to make my own warm salad the following night with pieces of cumin/sumac coated lamb, spinach leaves, marinated strips of capsicum, goats cheese and pine nuts - I'd hunted all around the market for caramelised walnuts, but to no avail). Damn tasty! 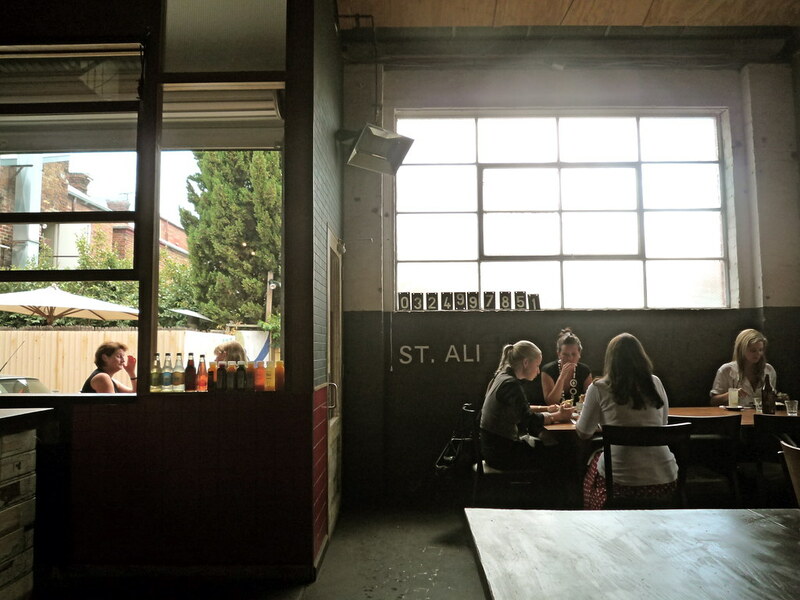 St Ali has a casually bright 'n breezy, open workshop sort of feel to it, which is unsurprising given all the coffee gadgetry, roasters and sacks of beans on display. In the latest Cheap Eats guide "coffeehouses" has been added as a category in the index, along with "creperies", "chinese" etc. 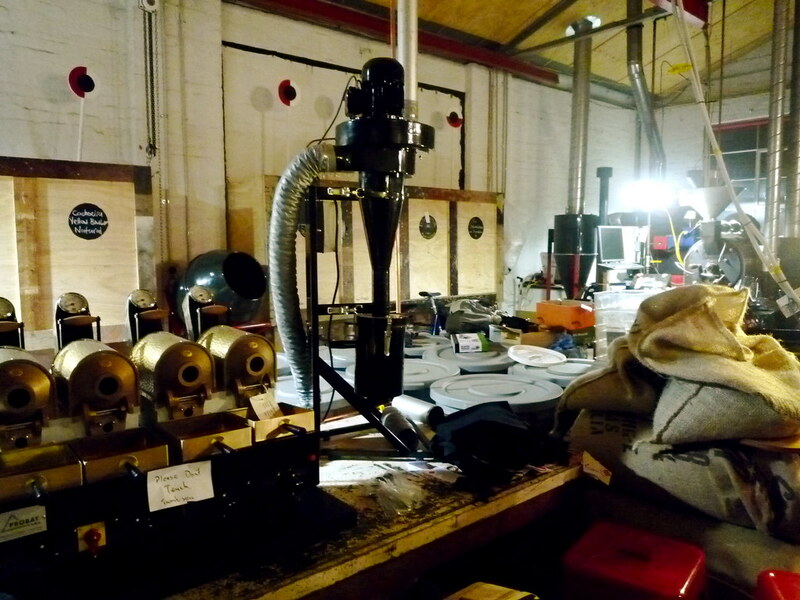 The listed coffeehouses are Auction Rooms, Dibella Coffee Roasting Warehouse, Liar Liar and St Ali. Given the growing interest in good coffee, I'll be interested to see if there are any more listed in next year's edition. "But Claire, what about the Slightly Intense Thirty-Something Metrosexuals?" I hear you ask. 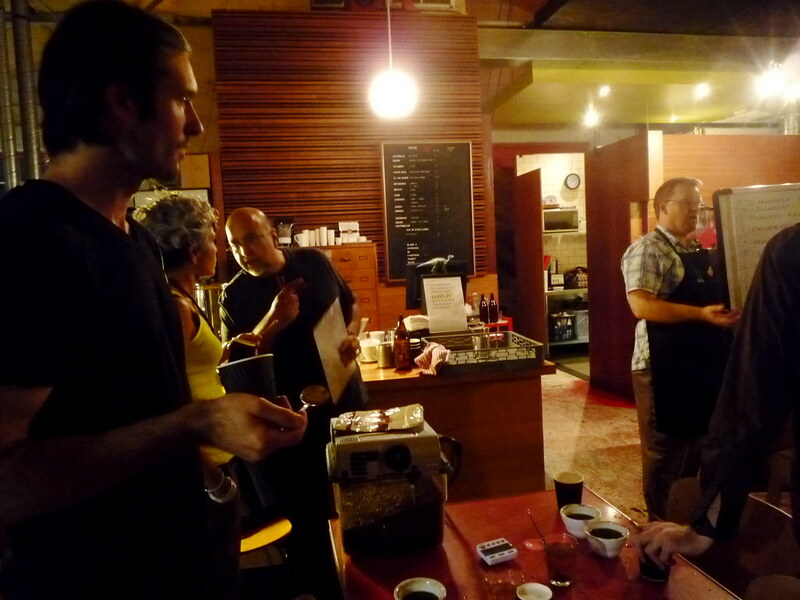 Well a nice foodie PR lady invited me to attend a specialty coffee cupping evening at St Ali, hosted last week by St Ali and Melbourne Coffee Merchants and featuring a presentation by Stephen Hurst and followed by a cupping session. 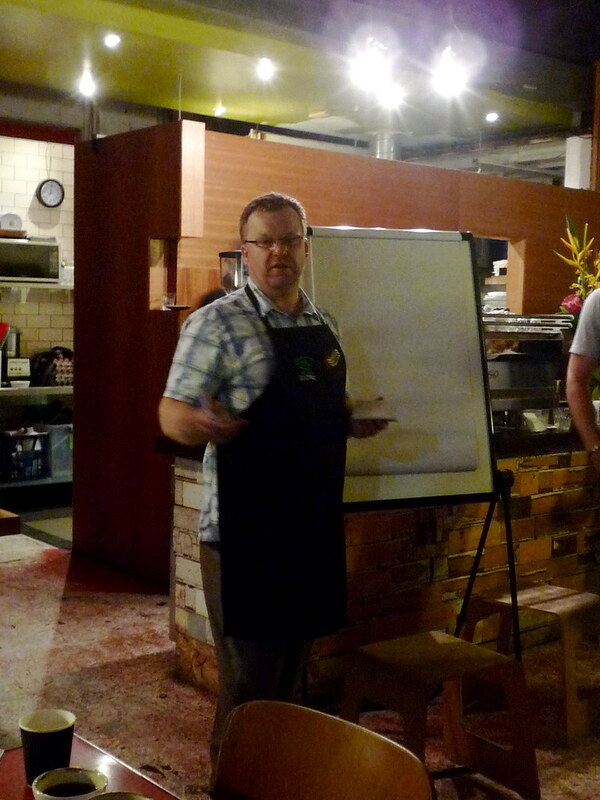 Stephen Hurst is the founder of Mercanta, a London-based specialty coffee company. He explained the history of Mercanta, the coffee market over the last 30 years and the Cup of Excellence, an annual competition to find the very very best coffees in the world (click on the link and read about it, it's an interesting concept). In discussing his work and fielding questions, he spoke with unaffected ease and clearly evident passion. Stephen was also happy to chat for quite some time with three Melbourne food bloggers (Jack and Sarah were there too) about blogs and how the internet is shaping wider coffee appreciation and the coffee industry as a whole. 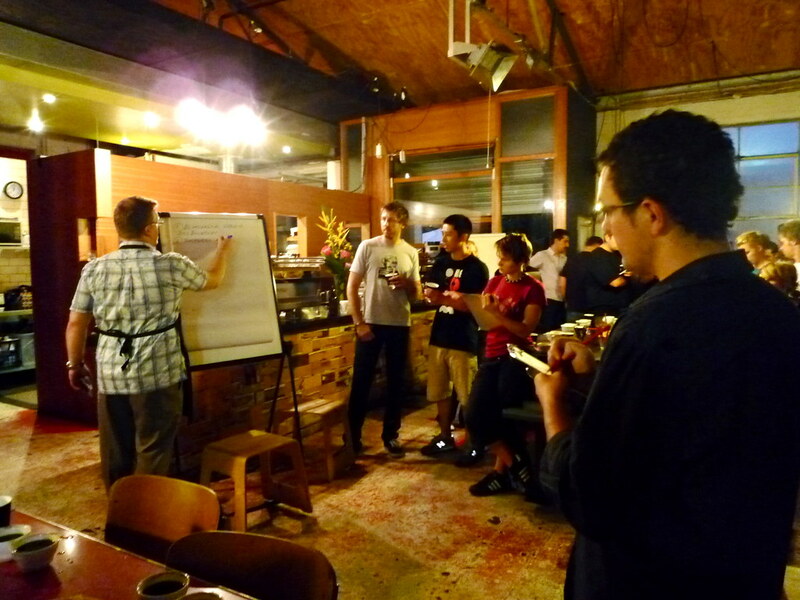 Apart from the three of us, the crowd appeared to be made up mostly of coffee industry types. As the preparations for the cupping began I was feeling pretty out of my depth given my minimal coffee knowledge, but luckily my friend Andrew from Auction Rooms was also there, and he kindly offered to guide me through the cupping. I observed to him that there was definitely a coffee industry type: slightly intense thirty-something metrosexuals, if the rest of the crowd was anything to go by. Not that I have anything against slightly intense thirty-something metrosexuals. 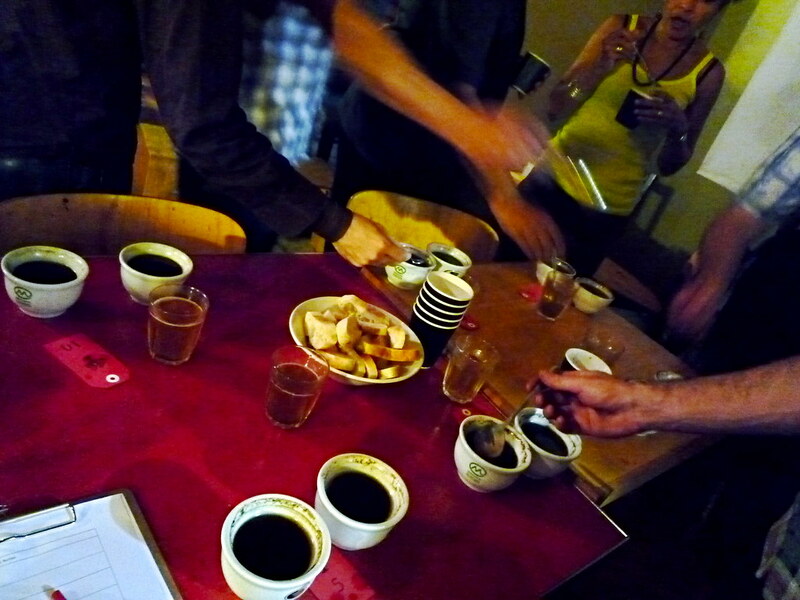 Cupping is the traditional method for breaking down the flavour profiles of brewed coffee. You roast a bunch of coffee to a certain level (generally lighter than for espresso), grind it to a specific coarseness, and then let it steep in hot water (not boiling) for a set period of time. Then breaking through the crust of grinds on the top and inhaling deeply the aromas of the brew, and drawing out as much detail as you can about the nose, before slurping it as you would if you were tasting wine. 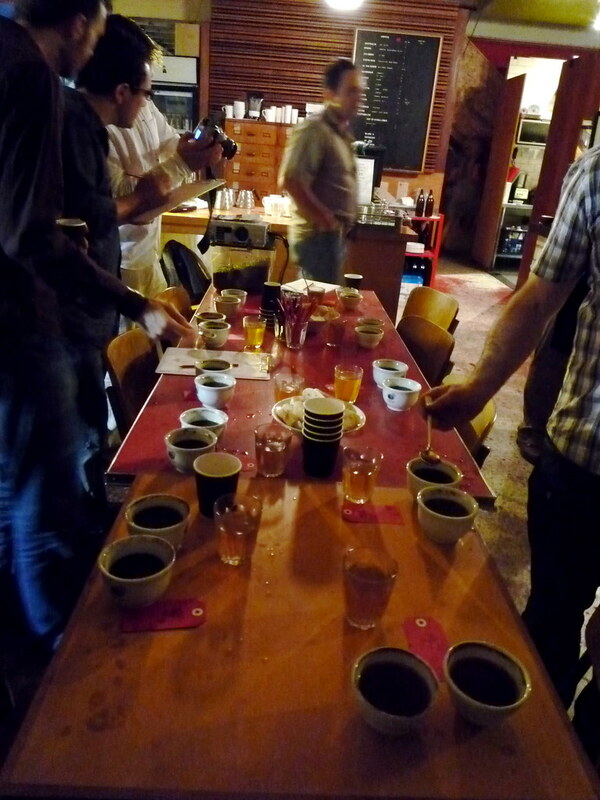 Aerating the coffee across your palate and assessing the acidity, body, and length of finish etc. 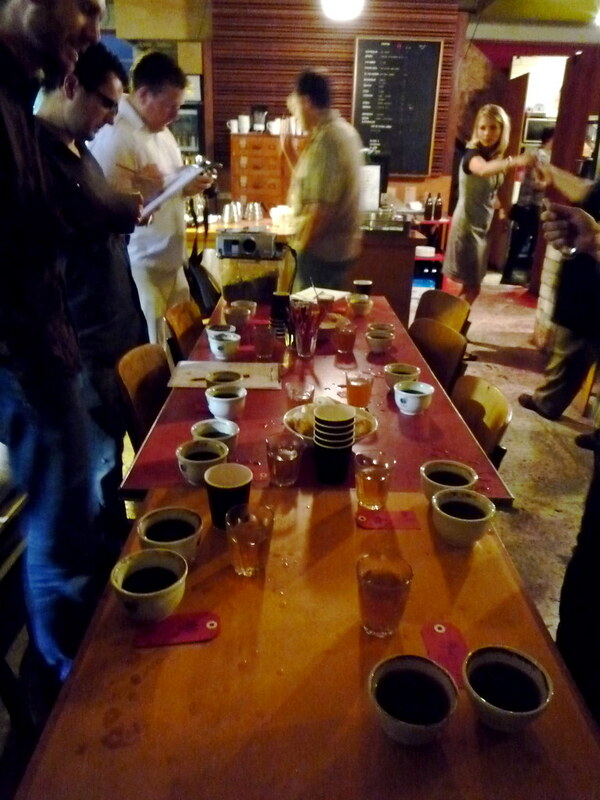 It was a blind tasting - two cups each of ten different kinds of coffee. I think it was four minutes after the hot water was added (a timer was involved) that we were encouraged to break the crusts that had formed on top. Andy showed me how to do it, inhaling the aroma as one pushed the flotsam away with a spoon and scooped it out of the cup. Then we all started slowly circling the table in a clockwise direction, taking a spoonful of each coffee and slurping it up violently so that the coffee became oxygenated at the moment it hit the palate (as a young winemaking student years ago I learned in Sensory Studies that this intake of oxygen opens up the flavour compounds in the liquid and lets you experience the flavour more fully). Although I tried, I couldn't slurp as loudly as the SITSMs. I was particularly taken with the blueberry flavour of the Harrar and the "brightness" of the Kenyan (thanks to Andy for supplying me with the proper vocab). Having done so many wine tastings in my time, it was fascinating for me to attend the coffee equivalent, and to gain a little insight into the world of specialty coffees. I paid the price though - because nobody at our table was spitting I too swallowed every sip of coffee, so came home absolutely bouncing off the walls. DJ had a good laugh at my over-caffeinated expense but it was no laughing matter: I didn't get to sleep until about 4:30am! 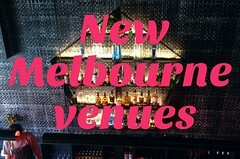 Update (18/9/9): You can read about St Ali's new South Yarra outpost here. Coffee appreciation and sophistication is obviously going the way of wine, beer, cheese and apparently oysters. I wonder what they would make of all of this in Naples, the so-called epicentre of good coffee. Great post. Love the image of you bouncing off the walls! Yes great write-up Claire. Made me laugh! I too considered the PR invite and thought at the time that such an event may be too "intense" for my cup of tea...err coffee. In the end having to be out of town decided it. And you getting wired till all hours was a puurler! Oh, I am jealous. I love coffee and St Ali. I will get back to you when I am jittery to prove my point. 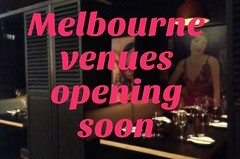 Sounds like the coolest thing in Melbourne until that 17 degree day that happened today. I also love coffee and St Ali, and have a low caffeine threshold, and the one time I went there and asked for a decaf soy latte on ice nearly WEEPING with embarrassment, the rather attractive guy was so supportive and nice (even though he thought for taste's sake I should go the 'real' coffee). I heart St Ali forever. How many coffees does it take to get you jittery, Bunches? For me it's anything more than one latte (lame, I know). Tee hee Cathy! My coffee friends have always been very tolerant of my low caffeine threshold, but lately I've started drinking more and more of it... it's all downhill from here no doubt. Hmm, perhaps they should hold these coffee events in the morning. Or are SITSM nocturnal?